Line a baking sheet with parchment. Using your hands, mix all ingredients together in a large bowl just until combined (overmixing may toughen the meat). Gently squeeze meat around 10-in. metal skewers to form log-shaped kebabs, each about 8 in. long. Put kebabs on baking sheet. Cover sheet with plastic wrap and, if you have time, chill 30 minutes to let flavors meld and firm up meat. Prepare a gas or charcoal grill for high heat (450° to 550°; you can hold your hand 5 in. above cooking grate only 2 to 4 seconds) and grill kebabs, turning twice, until grill marks appear and meat feels firm, 8 minutes total. Sprinkle with parsley. 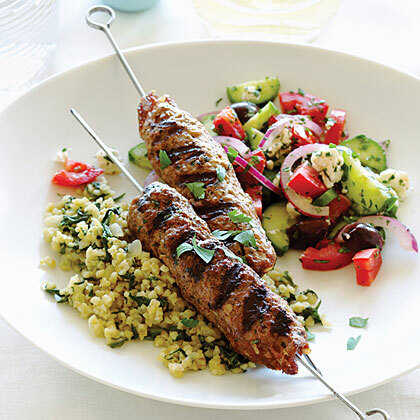 Make ahead: Make kebabs through step 2 and chill up to 1 day ahead.